I have been playing piano since I was a fourth grader when I started to take lessons from a lady who lived in our neighborhood. I also began playing the baritone horn in elementary school. In the seventh grade I began playing piano in church, and I have not stopped yet. When it was time to go to college, piano performance was the natural choice and I have been playing ever since. 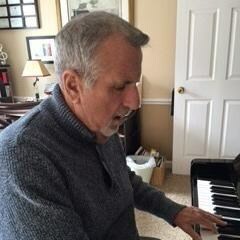 I am a retired choral director from New Hanover County Schools. I taught sixth grade for 14 years and then choral music for 16 years. At the state level I was the accompanist for the North Carolina SATB Middle School Choir for eight years. I have played for students from across North Carolina. I am currently the Music Director for Burgaw United Methodist Church in Pender County. Piano is a great way to introduce music into your child's life. Students are presented basic theory and piano literature which opens their mind and soul to this art called music. Students feel empowered taking those beginning steps, as they will lead to mastery of the instrument. Music is food for your child's soul!! !